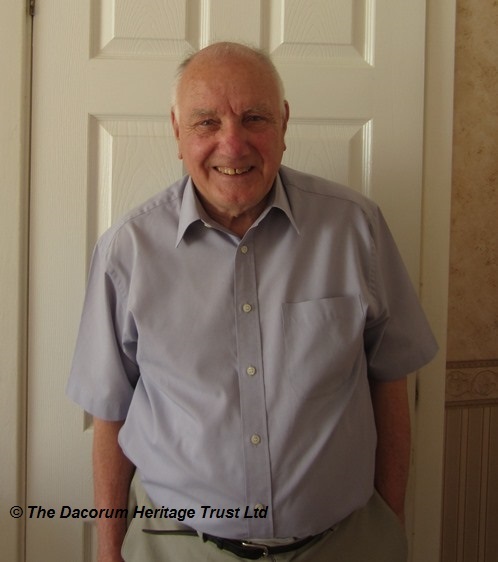 Saving the 70s- Derek Townsend DL | The Dacorum Heritage Trust Ltd.
We interviewed Mr Derek Townsend DL in the summer of 2014. Derek joined Tring Urban District council in 1971 and in this interview he tells us what life as like. Here are a few clips, which we hope spark some of your own memories. Transcript: I joined the council in 1971 and that was Tring Urban District Council, Dacorum had not been invented there. It was Hemel Hempstead Borough council, in 1971. There was talks about amalgamating all the councils and therefore Tring was one of those that was going to be amalgamated, the old Hemel Hempstead Rural or the Hemel Hempstead District, Kings Langley Parish and all the Parishes would disappear and go into one pot. Then in 1973 nominations from Tring were sent to Hemel Hempstead to find a new name for the new authority and naturally the Hemel Hempstead councillors, “oh let’s call it Hemel Hempstead District Council” and the Tring said “No, let’s call it Tring” and Berkhamsted said “Berkhamsted”, you cannot loose identities and they did not want that to happen. So the negotiations were that the smaller Parishes could have their own town council but they had to precept to keep the council to pay for it, that’s why the rates are higher in Tring and Berkhamsted and Kings Langley cos they have a precept on top, whereas Hemel has not got a Parish order and so they do not pay a precept. As you look at the Mayors chain,* that will tell you everything, you will can see the stags of Tring, you will see the castle of Berkhamsted, you’ will see Henry VIII of Hemel Hempstead, it tried to identify four towns on that badge and the other extra badge that I put on was for the Queen’s Jubilee, celebrations. Which I purchased to put on the chain and you can see it in the middle of the chain when you see it. *Identifies 3 towns on the badge and the trowel which represents the New Town. A special coin was added to celebrate the Queens Silver Jubilee in 2002. 1977 Silver Jubilee Transcript: We did buy about two or four hundred coins we gave to the kids in Tring, as a remembrance. I know there were street parties going on, I know we gave the kids the coin and I think in Kings Langley they gave them mugs. All of them did their own little thing. Building the A41 Transcript: Yes I do remember that very well, because there was quite a little argument about it from the Tring Residents Association, who were not happy with where it was being placed and there were certain objections, they wanted it to go on the other way by the reservoirs. But the bird life and the bird lovers and everybody else said it would damage the wildlife there and it is a ‘land of outstanding natural beauty’ and all this business and of course it would be better if it is by the reservoir because it had better linkage with Aylesbury going that way round. But at the end of the day, RAF Halton was over there and by putting a bypass there down this side on it, if you look carefully every town from Kings Langley, it’s always on this side, the towns are and suddenly it gets to Tring it goes the other side and the reason being is that it was a land of outstanding natural beauty and in the end it went through Tring Park which was the cheapest part. The only thing is that it interfered with was the farm. The farm house was there and the road was there, his land was completely chopped in half and we did lobby for a tunnel for the cattle to go underneath by the roundabout as you come into Tring, but they said it was too expensive, so the farmer then had to take his sheep and cows under the bridge but they had to have three vehicles, stopping traffic there and there and there so the cows could get to the other fields. In the end it was not economical and Mr Monks gave up the cows and now he just keeps chickens and a few pigs and that is it. When we did do a survey on the bypass, I think we counted something like 30 or 40 vehicles per hour going through from that end of Tring to the other end of Tring, because they did not go to Berkhamsted there, they come off and it was not until the M25 came on stream and of course the new bypass to link Aylesbury with the M25 that suddenly the influx of cars got busy and now, well, it never stops, non-stop. There was not much, you can not say the Tring people objected as at least it was taking traffic off the High Street. Oh Positively Yes, it allowed the High Street to be more community motivated, you could not have the cars going through there now, impossible, imagine the traffic now. As soon as you get an accident on the M25, M1 what happens to Hemel Hempstead? Standstill. Building of the Magic Roundabout Transcript: It will never work! The idea was bloody stupid, I said, you cannot have people going both ways on a roundabout, I said, they must be barmy. I did think, they did not publish that, but I did say they were barmy, but it did work and it saved a lot of money because they were going to build a fly over to link the M1 to the A41 so they got away with that, saved a lot of money, they would not get a fly over there now with all the flats they have built round it. Transcript: I do remember that I was part of the march and you will also see a photograph somewhere around of when we put a ring round West Herts and held hands all the way round the hospital and my wife and I held hands there and the funny thing about it was that it does not affect us in Tring because we use Stoke Mandeville so I did not do it for my own I done it because there’s a popular of 100,000 people without a hospital and there is Watford with 90,000 with a hospital where is the balance? Transcript: oh that was another protest group we were in. The law at that time allowed another authority to come in and buy land and that’s what they did in Tring and they found out about this bit of land because Tring Urban District council wanted to buy it for the next generation of Tringites for building houses for people in Tring so therefore when you build houses you have to go to the government and you borrow their money to build the houses so we had to borrow money they would not let borrow it. They wanted to buy the lot but we did not want the lot we only wanted enough for 10 houses this year 10 houses next year and so on for life but they would not let us do that so the GLC (Greater London Council) stepped in and brought the lock stock and barrel and naturally the Urban District Council meeting Gordon Walters was the chairman cor he went barmy how dare they walk into another town and just take over but unfortunately. That law has been changed now, another authority can not go into another authority and buy land without first consulting doing what they did was wrong that has all changed now. Trip to our Twined Town Transcript: My wife will tell you a good story because she came to greet me when I had finished my duties of the children and her first words she said “Christ you do look ill she said you alright?” She said “you are white and cream colour” she said “I do not know what you have done” She said “do tell me what has been going on” so I did tell her and it was traumatic. We have had travelled to France to St Pierre I think it was a little village and they wanted to be twinned with Tring they were the same sized town and all the facts are as I tell them as true as I remember them. Going out was wonderful the first problem I had was we took them up to the not the tower but the other one Arc de Triomphe there is a museum up there and we went up the lift and I said to them all “whatever you do don’t leave this building if you want to go to the toilet give us a shout and we will take you down in the lift and bring you back up” well it all went down well and looked at the museum and at the end of the visit one was missing we did not know what to do we asked and I said “I’d go down speak to the police” and when I got down there, there he was after about an hour we found him and that was traumatic in itself because I thought I had lost a kid and then walking by the Eiffel Tower one of the little boys got mugged he had his wallet stolen from him as he opened his wallet to buy something someone snatched his wallet from him so he lost his money and then on the second day we had a phone call from one of the mothers saying “please could you remove this boy I can’t stand him any longer he is driving me around the bend” so we had to find another bed for this boy and I said “I would never take him away again” and final coming home I thought god its nearly over soon be back in England and I did notice a lot of movement from the children going into the corridor and I said “where you going” and they said “toilets” and I could not stop that so I let them. When it got quite a few missing I got a bit worried and all of a sudden there was a massive great bang the whole carriage seemed to shake “god what’s gone on there?” and I rushed round the side where there was a corridor train, rushed down the side and they all came out of this toilet and a power of smoke coming out and they had stuck bangers all down the tube where the communications cord was I could not believe the shock I dragged all of them back to the compartment and said “god don’t you dare move from there again” sat them all down and they were so quiet I was worried I did go back again and I said “what are the hell they looking at?” and I noticed they had got all dirty pictures of girls. So that was my trip to France very eventful very stressful I did go out with hair on my head and come back with none if that’s a good idea what it felt like. The other councillor came with me said “I do not know what you are worried about they are alright” he says (JL:so you would not do it again then?) Never, Never.